Where the fresh waters of Lake Malaren meet the salt water of the Baltic Sea you’ll find the capital city of the Kingdom of Sweden– Stockholm. This political and cultural center of a country a bit larger than California is on 14 islands connected by 57 bridges. Its water is so pristine that you can swim or fish in it and, if you’re lucky, catch a salmon right outside the Royal Palace. The waterfront walkways offer views that include a medieval structures and a royal palace, and the big-city attractions are balanced with plenty of fresh air and green space. 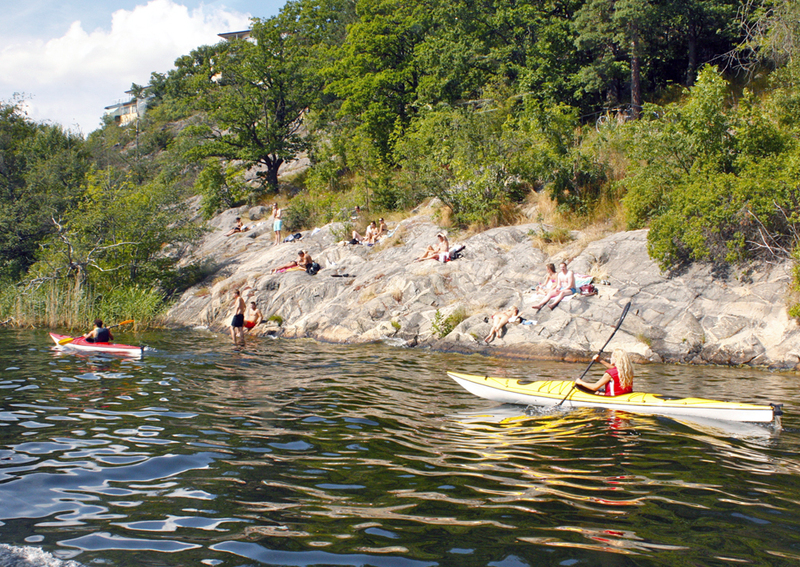 Stockholm residents enjoy their long and sunny summer days at outdoor restaurants, in parks, on the beaches, and in the archipelago, one of the largest and most spectacular in the world. With more than 20,000 islands, it extends over 50 miles. Stockholm is a modern city known for sleek, stylish design where you can stroll the lanes of one of the Europe’s best preserved medieval cities, see the only remaining 17th-century ship in the world, and hop aboard classic white archipelago boats–some a century-old and still steam-powered–for an island excursion. Stockholm means “log island”, and legend has it that it was settled after the gods told the Vikings to set a hollowed-out log laden with gold afloat and to relocate where it landed. The earliest documented mention of Stockholm was by Birger Jarl in 1252. Stockholm grew as a trade post of the Hanseatic League, an alliance of seafaring merchants and commercial cities that had a monopoly in Northern Europe. The Kalmar Union of 1397 united Sweden and Norway with Denmark under Danish rule. Gustav Vasa, whose father was among those massacred in King Christian II of Denmark’s Stockholm Bloodbath of 1520, drove the Danes out and abolished the pro-Danish Catholic Church, its monasteries and tithes. He became King in 1523, made Lutheranism the state religion, and eliminated the Hanseatic League. In 1544 he made the Swedish crown hereditary. Under Gustav II Adolf, the only Swedish king known as “the Great”, 17th century Sweden ruled the Baltic region. A century later, Peter the Great’s Russia became more powerful and usurped Sweden’s dominance. Between 1846 and 1930, a time of population growth and crop failures, over a million Swedes, about twenty percent of the population, emigrated to the United States. 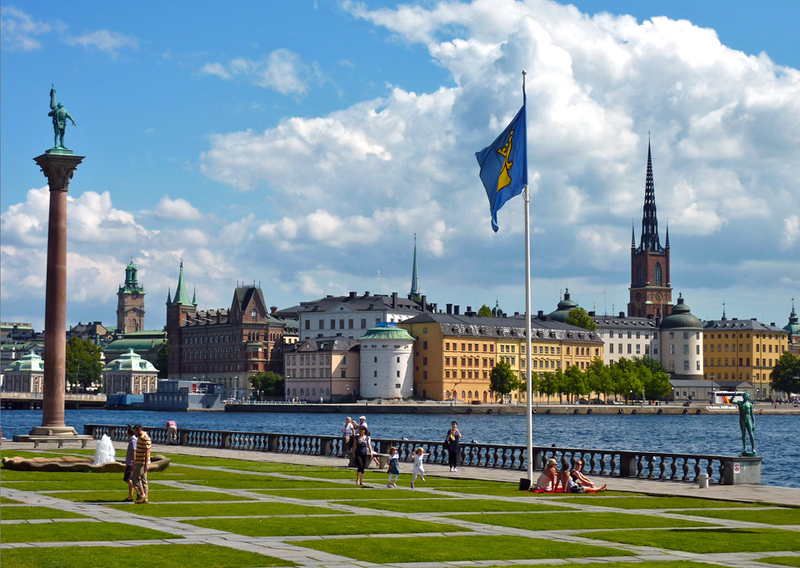 As a neutral country, Sweden has been spared the ravages of war for nearly two centuries. In the past century, it has become one of the most prosperous European nations. With today’s limited constitutional monarchy, the role of its king, King Carl XVI Gustaf, is ceremonial and representational. The parliamentary system (Riksdag) governs, headed by a Prime Minister, Fredrik Reinfeldt. This progressive society is eco-friendly, with cutting-edge technology and gender equality. The Swedes have one of the world’s most comprehensive cradle to grave social programs, one of the world’s longest life expectancies, and one of the highest literacy rates and standards of living in the world. Forty-three percent of parliamentarians are women, and Sweden’s constitution was revised in 1980 to allow royal succession by primogeniture regardless of gender. From its sleek, innovative designs to its charming red and white wooden summer stugas, today’s Sweden is among the best places in the world to live or visit. Strömma Kanalbolaget’s Stockholm in Vaxholm. One of the easiest ways to get to know the city is with a narrated tour by bus or boat. City Sightseeing offers a variety of land and canal tours. 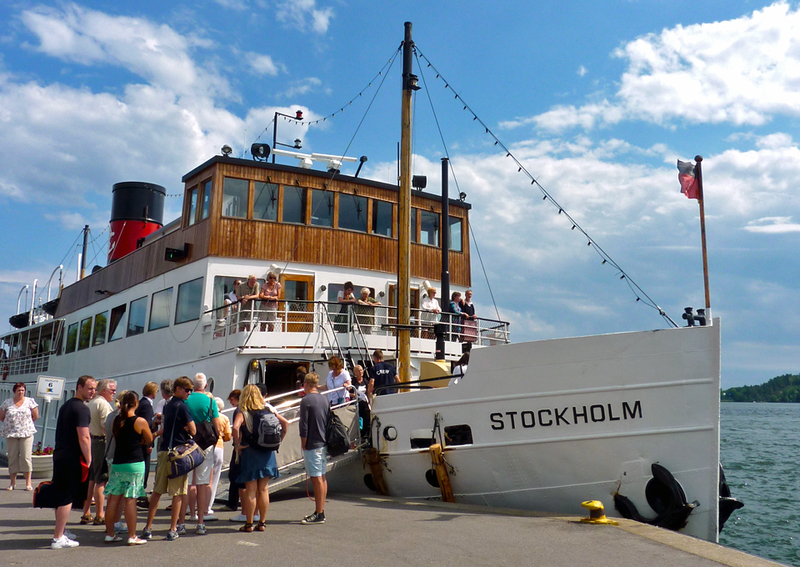 To venture farther, Strömma Kanalbolaget has top-notch excursions, from Skokloster Castle in Lake Malaren to Sandhamn on the outskirts of the archipelago. 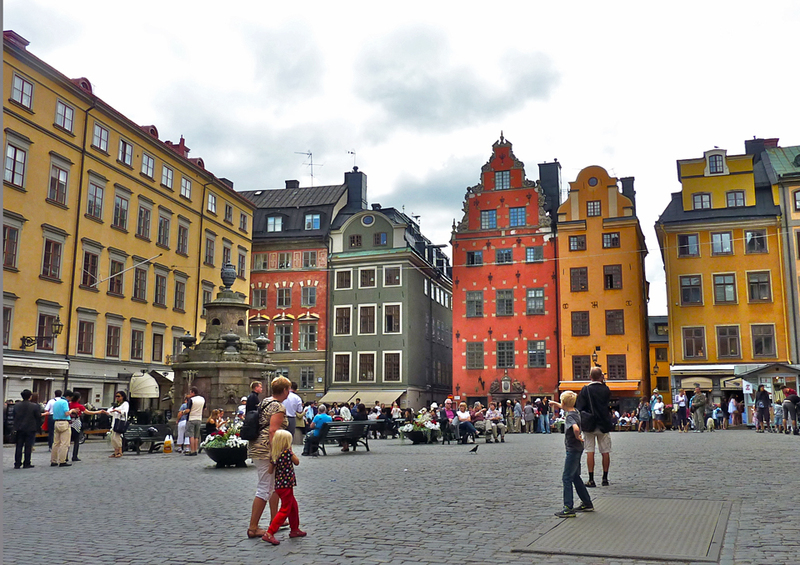 Walk the cobblestoned lanes of the medieval core and birthplace of Stockholm, Gamla Stan. A great fire destroyed most of the Old Town in 1625, and many of the structures that remain are from the prosperous period that followed. It’s the most visited district of Stockholm and has been the official home to the monarchs since Birger Jarl built his fortress here. The Bloodbath of 1520 took place in the large and colorful square, Stortorget. Danish King Christian II offered amnesty and instead decapitated over 90 assembled men one by one. The Royal Palace, with more than 600 rooms, is one of the world’s largest inhabited palaces and was built on the site of the old Tre Kroner Castle, which burned down in 1697. Much of its splendor is open to the public, and at noon there’s a changing of the Royal Guard, established in 1520 to protect the king. 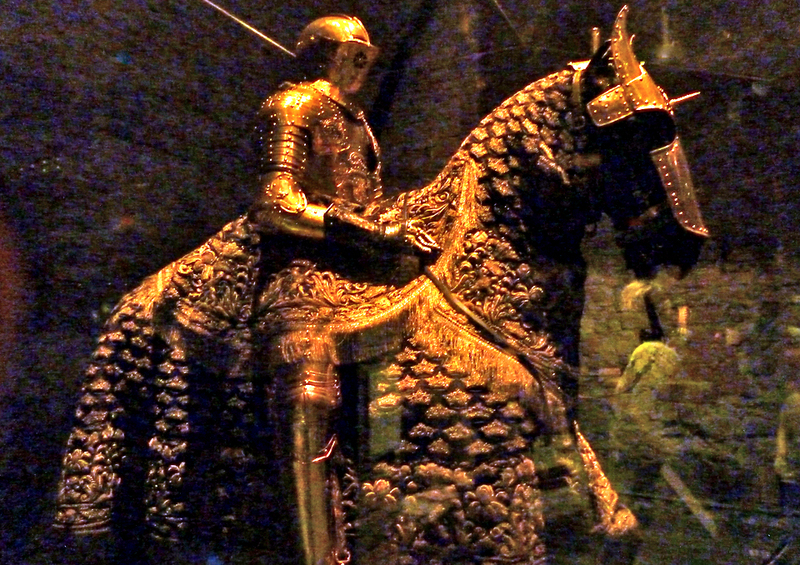 There are also fascinating royal museums, like the Royal Armory, with regalia, clothing and suits of armor worn by royals through the centuries. Treasures of the mid-13th century Cathedral, Storkyrkan, include a detailed statue of St. George and the Dragon representing Sweden’s victory over Denmark. This is the site of royal weddings, including that of Crown Princess Victoria to Daniel Westling, a commoner, on June 19, 2010. 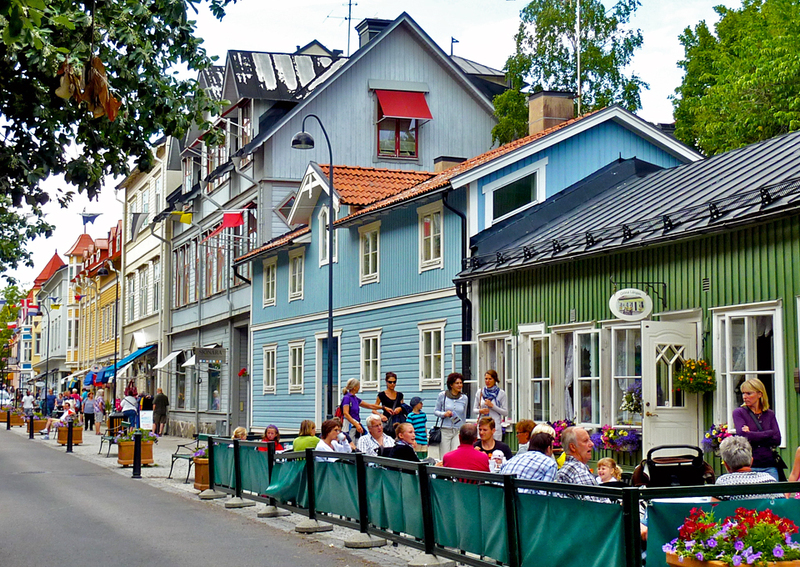 Allow time to explore Gamla Stan’s art galleries, shops with Swedish crystal, handicrafts, and antiques, and to take in the unique atmosphere at one of the many cafés and restaurants. 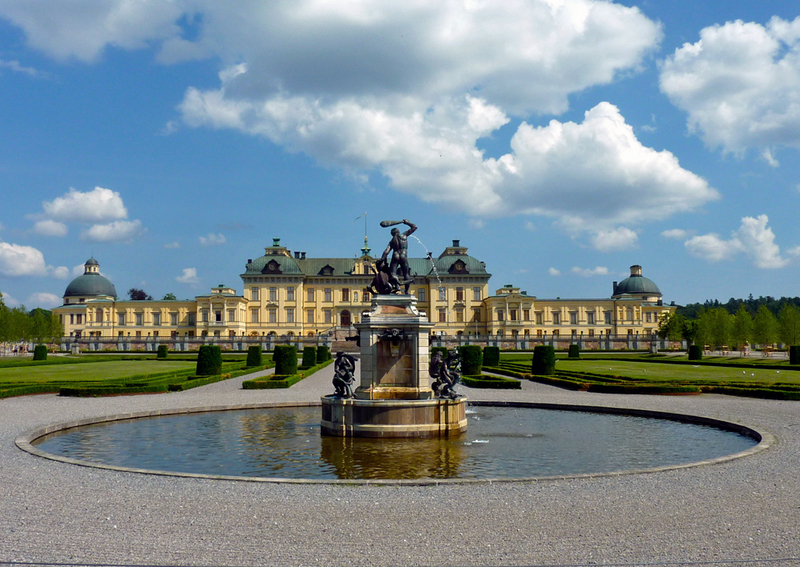 The present King and Queen of Sweden have chosen to live outside the city in Drottningholm Palace, built in 1662, around the same time as Versailles. Most conveniently reached by a Strömma canal boat, it is the first Swedish site to be included on UNESCO World Heritage list. Except for the Royal Apartments, which are off-limits, the rest is open, including the Royal Apartments, gardens, and Chinese Pavilion. The Court Theatre is one of the oldest theaters in the world, preserved in its original state. It is a product of Sweden’s Golden Age when Queen Lovisa Ulrika and son King Gustav III entertained extravagantly. In summer, you may catch a performance there. The landmark City Hall, Stadhuset, is the most distinctive structure on the Stockholm skyline. It is best known for the Nobel Prize banquet held here December 10th each year. After dinner, Nobel laureates, royalty and guests dance in a Golden Hall decorated with 18 million gold mosaic tiles depicting Swedish historical figures and events. Stadhuset’s tower offers an amazing view of the city. 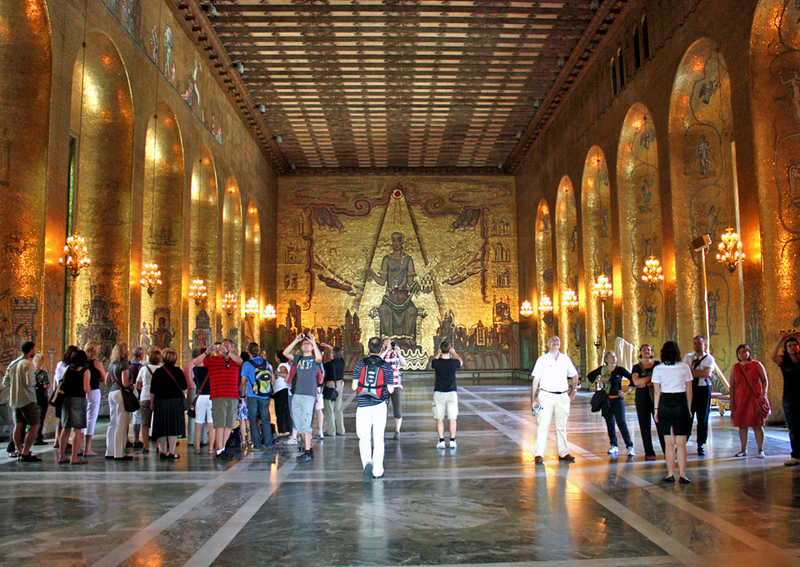 Tours are available in English and include a City Council room with a ceiling in the shape of an overturned Viking longboat, and the Golden Room, site of the Nobel banquet ball and adorned with 18.5 million gold mosaic pieces depicting Sweden’s history. There’s also an ABBA CityWalk in English that meets by the oak tree in the City Hall courtyard Tuesdays in summer. Among the boat tours that depart from this area is the Historical Canal Tour, included with the Stockholm Card. Alternatively, stroll the waterfront walkways, perhaps opting for another cruise from one of the other departure points along the way. Djurgården the former royal hunting grounds, is a forested area that is part of the National City Park and site of elite homes and four royal palaces, including Haga, home to Crown Princess Victoria and Prince Daniel. The world’s oldest open air museum, Skansen, dates to 1891 and inspired Colonial Williamsburg and other living history museums. 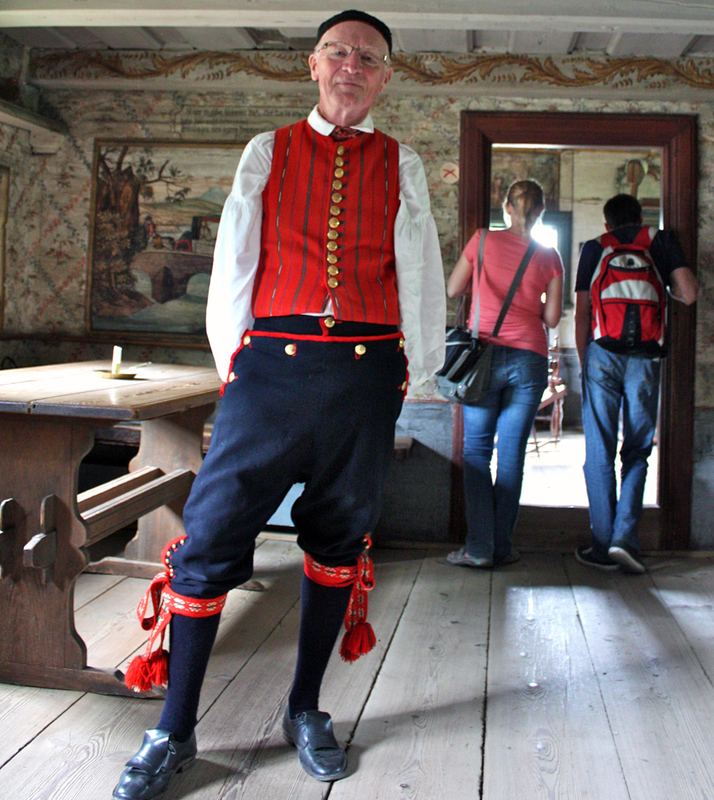 This microcosm of Sweden’s past has over 150 historical buildings–including homes, shops, old farm dwellings, and churches — from all over Sweden, staffed by costumed reenactors. Also onsite is the largest aquarium in Sweden and a zoo with Nordic animals like elk, bears, and moose. 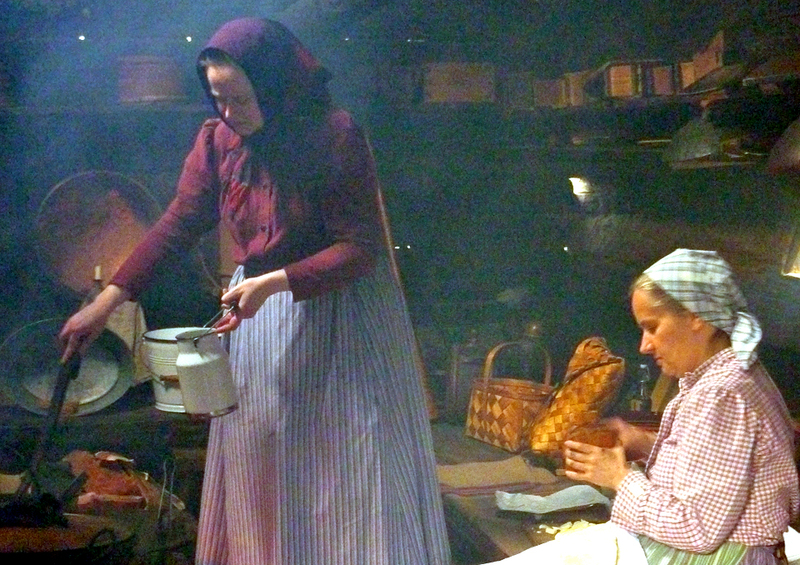 It’s a place to learn about traditional Swedish handicrafts and folklore and to try traditional foods from Sweden’s forest or sea. This favorite of Stockholm residents is where festivals, sing-a-longs, markets, nightly folk dancing displays, and other celebrations are held. In December there’s a Christmas market and traditional Christmas buffets. The royal family joins the fun celebrating holidays like National Day, June 6. The 230’ richly ornamented ultimate warship built to show King Gustav II Adolf’s power sank in Stockholm’s harbor on its maiden voyage in 1628. 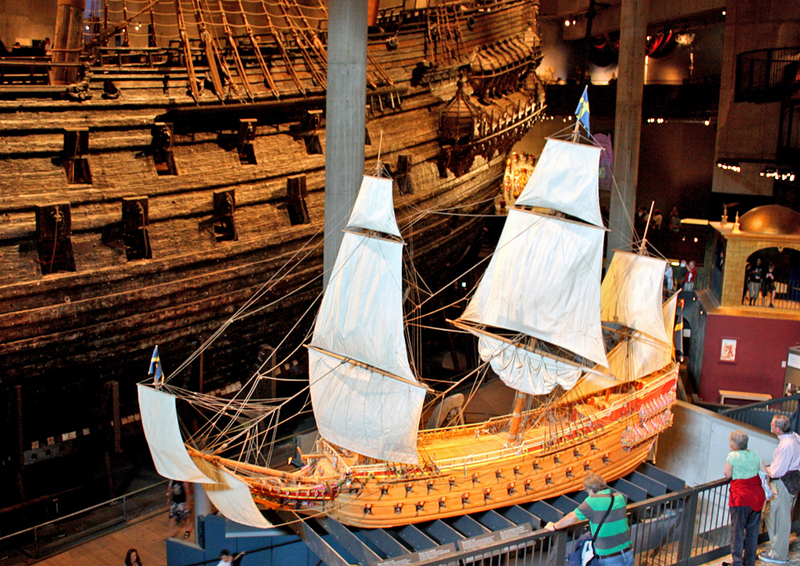 It has been restored and is in the Vasa Museum, Scandinavia’s most popular museum. Next door is the The Nordic Museum, established to preserve the Swedish culture that founder Artur Hazelius, who also founded Skansen, thought would disappear with the industrial age. Children love Junibacken, the fairy tale house dedicated to Astrid Lindgren, who wrote Pippi Longstocking. Board a train to see storybook characters and end in Pippi Longstocking’s amazing house. 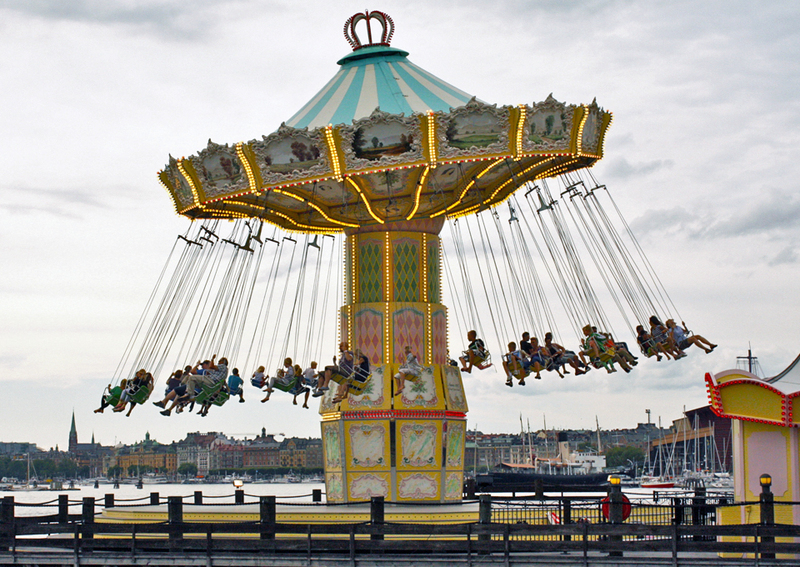 Gröna Lund, also on Djugarden, is Sweden’s oldest amusement park. Ella Fitzgerald and Paul McCartney are among those who have performed here. The National Museum of Fine Arts, Sweden’s largest and premier art gallery, has world-renowned collections of paintings and sculptures, drawings, engravings, and handicrafts. It also features a permanent exhibition of Swedish design. Cross the bridge to Skeppsholmen and the Museum of Modern Art, one of the world’s top museums for 20th and 21st century art. Its 20th century pop art is considered best in the world.The restaurant has great views of Djurgarden and the grand Strandvagen esplanade. With relics from the Stone Age to the 16th century, the Swedish Museum of National Antiquities, or Historiska Museet, in Östermalm, has the world’s largest Viking exhibit, and a Gold Room with treasures that include a reliquary made from a Byzantine drinking vessel, two royal crowns and precious stones. 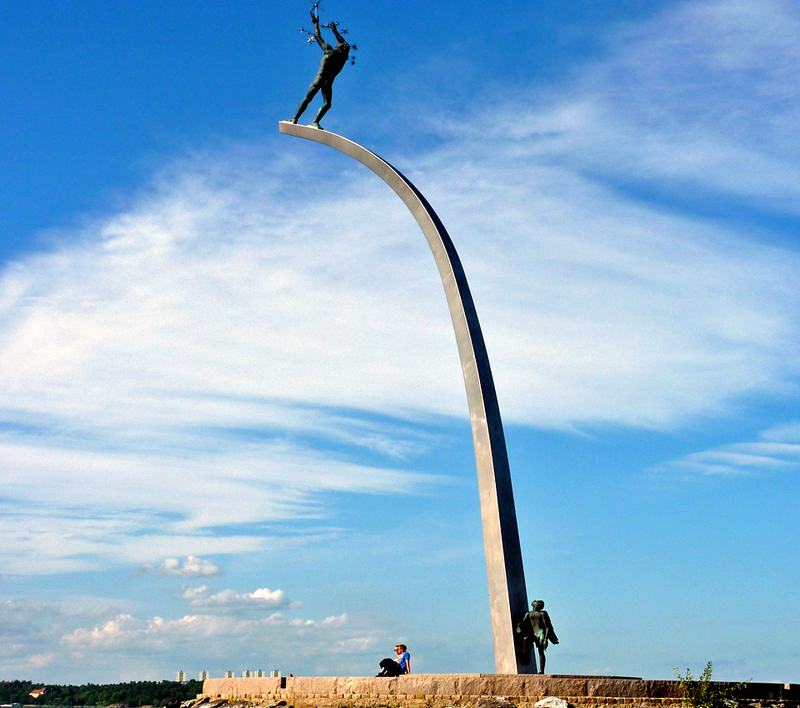 Millesgarden is a beautiful sculpture park on the island of Lindingo created by Sweden’s premier sculptor, Carl Milles, who wanted his art to be a part of natural surroundings. Most of his works are on high pedestals, creating silhouettes in the sky. His signature work, Hand of God, is on a cliff overlooking Stockholm. Fotografiska, opened in May 2010 in the old port warehouse. It is one of the world’s largest venues for contemporary photography, with four major exhibits and about 20 smaller exhibits annually. The cafe on the top floor has one of the best views of Stockholm. The journey along the scenic archipelago in one of Stockholm’s classic boats is attraction an itself, and many boat tours offer meals onboard. There’s a perfect island destination whether you want to hike, swim, shop, take in a little history, or just enjoy the sunshine and a good meal. Although many have bus and train access, there’s nothing else quite like getting out into the water in one of Strömma’s classic boats. Here are just a few of our favorites. Twelve miles west of Stockholm is Birka on the island of Björkö in Lake Malaren. Archaeologists have unearthed artifacts here dating to the 8th century. This Viking Age trade center and UNESCO World Heritage Site was Sweden’s first town and continues to attract visitors from near and far. 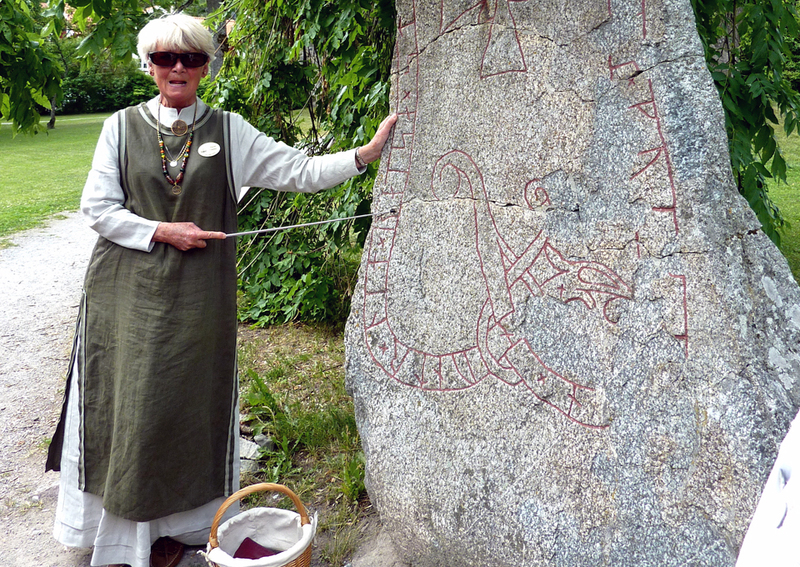 Rune stones, churches, and ruins remain as evidence of the early Viking and Medieval residents of Sigtuna, Sweden’s first city, founded in 980. Shop, dine, and see Viking artifacts in in a pedestrian-friendly area of charming 17th, 18th, and 19th century wooden buildings. Four area castles include Royal Rosenberg Palace, which has overnight accommodations, and Skogloster Castle, an optional stop on this boat trip. Fjäderholmen, the island group closest to Stockholm, is just a 20 minutes boat ride and a convenient way to experience the archipelago. Hike the eco-park, watch glass blowers, woodcrafters, and other artisans at work, buy hand-crafted souvenirs, relax in the sun, or sit by the water and enjoy a beautiful sunset with a meal, coffee or an ice cream. 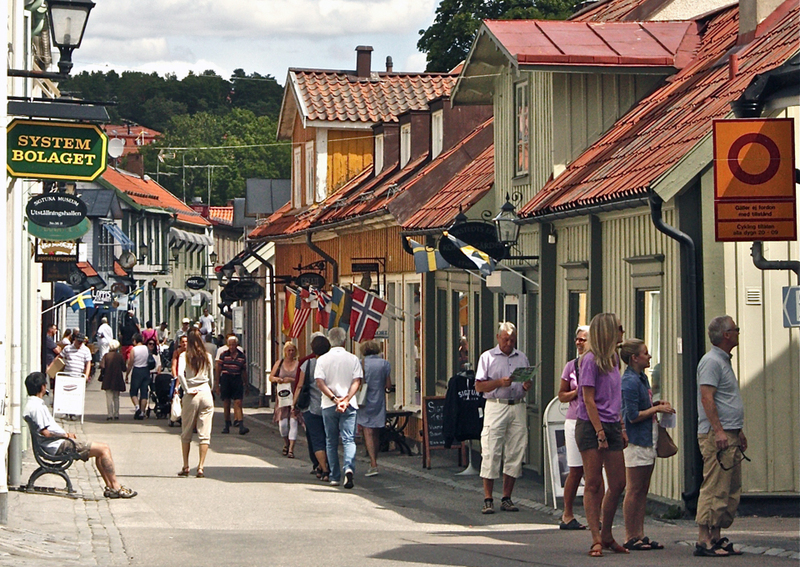 City dwellers daytrip to Vaxholm on weekends to enjoy the cafes and shops in charming 19th century pastel painted wooden houses as well as the harbor views. There is a museum in the impressive fortress, originally built in 1544 by Gustav Vasa as a defense against naval attacks on Stockholm. Sandhamn is one of the largest and best-known islands, made famous by the writings of Strindberg and Bergman films. It’s where the inner and outer archipelagos meet, and is about two hours from the city by boat. Stockholm’s most most luxurious department store since 1902, NK, is the place to find Swedish and international designer fashions, crystal, and ceramics. Ahlens, Sweden’s largest department store, has more competitive prices for clothing and housewares, several reasonably priced restaurants, and a grocery store in the basement . For the latest trends in fashion, art, jewelry, and ceramics from established and yet-undiscovered Swedish artists and designers visit the SoFo area in Sodermalm. It’s also the place for a night on the town. From the airport: The Arlanda Express train to the City Terminal takes about 20 minutes and runs every 15 minutes. Coach service is less expensive, takes about 40 minutes, and runs every 5-10 minutes. Taxis are best if you have more luggage than you can easily manage. In the city: The metro, tunnelbana, or T-bana, is known as the longest art gallery in the world. Featuring works by many of the country’s leading artists, it runs around the clock. The Stockholm Card, is a great convenience and includes admission to the major attractions as well as use of subways, buses, and sightseeing. Buy it at the Tourist Information Center, Vasagatan 14, right across from Central Station. This walkable city has broad range of hotels. Our favorites include the Radisson Blu Royal Viking, and the Sheraton, both near the Central Station, City Hall and excursion boats, as well as the Sheraton Slussen, which overlooks Gamla Stan. The Radisson Blu Strand and renowned Grand Hotel, frequented by royalty and celebrities, are in an elegant area of museums, theater, boats, restaurants and nightlife. The meatballs and pickled herring are renowned, but Stockholm is also a gastronomic hub with world-class cuisine. The renowned Operaskallen, the city’s ultimate dining experience, is known for Court restauranteur Stefano Castanacci‘s international cuisine served with innovative contemporary flair. Stop for a cocktail at the terrace bar and enjoy regal views across the water to the Royal Palace. To cut costs, make your main meal the bountiful smorgasbord-style hotel breakfast and choose simple, local foods in bakeries, cafes, and markets later in the day. At restaurants, lunch can be half the price of dinner, especially with the “Dagens Rätt , or plate of the day. In the upscale Östermalm’s Saluhall, an old-fashioned covered food market in a building that dates to 1888, you can wander the stalls of fish and seafood, meat and poultry, cheese, chocolate, fruits and vegetables, and flowers. Enjoy lunch here or search for ingredients for a picnic in an historic square, park, or along the waterfront. You may want to stop at Ejes Chocolate in this fashionable Östermalm district. It bears a Royal Warrant, and their chocolate pralines are said to be Queen Silvia’s favorite. The coolest experience in town is IceBar Stockholm, in the Nordic Sea Hotel, the world’s first, and of ice from the renowned Ice Hotel in Lapland. For the latest on what’s happening in Stockholm pick up a free What’s On event guide, available throughout the city.